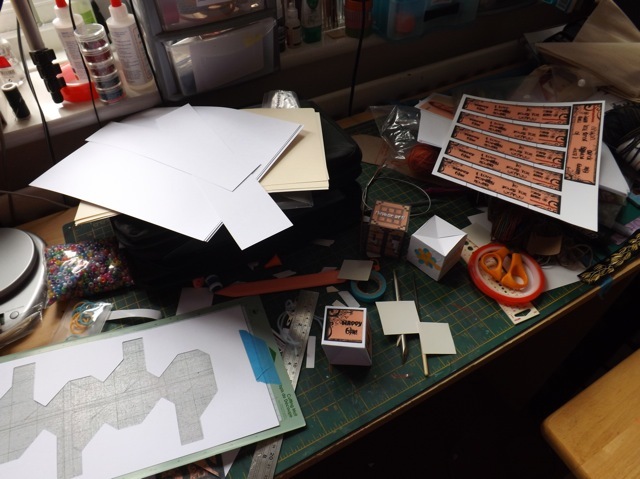 Lovely busy desk with lots going on. Your ATCs are going to be lovely. Thank you for your lovely comment, and I did see Diana’s fabulous teabag art this week! I’ve got my embroidery to turn to if I feel up to it but I’m not pushing it, and will wait till I’m feeling a bit stronger post-surgery, I think. I started doing atc’s but I’m just too busy these days. Your display is gorgeous. 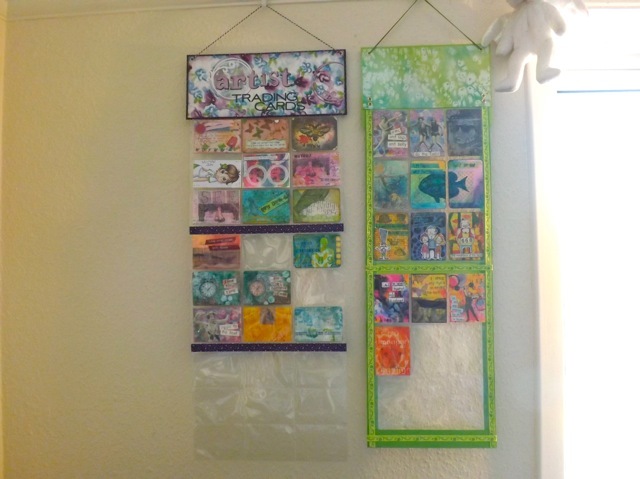 Oh my goodness, Mary Anne – I haven’t even given ATCs a thought yet – must do so soon! Thanks for visiting already – we did indeed have a great day out – John was pretty exhausted by the time we got home at nearly 9pm – but it was great he could do it. As to the website for church – you really would think that after all this time Apple and Microsoft could talk to one another and agree a format so I only had to produce the site once, wouldn’t you???!!! Nearly got the Welsh pages up and running, anyway – the translator is doing an amazing job of getting it ready for me to simply put words into the boxes. Fortunately, I know sufficient Welsh to make sense of what should go where…. Loving the ATC displays. Thanks for sharing your desk. After all that explanation I still don’t have a clue what you are going to make….. never mind. I love your ATC storage. I don’t make many ATCs, just a few for my friends with my name and address on it or a Bible verse if appropriate for the occasion. I haven’t given the ATC swap a thought as yet ….but I will now 🙂 Thanks for the nudge. Geez you are not giving away much are you with the ATC’s have you thought about waterfall ATC’s like the waterfall card, it could be an option for you. I do love the displays you have made already, which reminds me if I want to participate then i better get my skates on too. Thanks for sharing and have a wonderful week. You said that tin all innocence didnt ya…’limited by the tools I own’. Seriously, if I’d had coffee in my mouth,, I’d have spit! See that’s the problem of an ‘enquiring mind’, you push everything till it won’t do what you expect!! Your un-enlargeable photo looks very interesting, I sense something stampotiquey and erm, cubey!!!! I just can’t make ATC’s.Too small!Like yours though. oh wow, you are so organised, I haven’t given anniversary atc’s a thought yet!! your hangers are great though, mine (both years) are still in bags… Helen 3 (oh, shopping alert btw)!! So how do I swap ATC’s with you?